One of Rise Kohyang High School’s core values is service to others. Although a mandatory 50 hours of community service per year may seem daunting to students at first, many of our Tritons have already met or exceeded this goal. After opening in fall of 2016, our students have joined Koreatown Youth & Community Center monthly to plant trees, clean up streets, remove graffiti, and paint murals. Our students have also worked tirelessly with the Cudahy City Council to bring awareness to issues facing the immigrant community. Other organizations our students have teamed up with include Big Citizens Hub, Dogs Without Borders, and the Rabbit Rescue Inc. Most recently, over 30 Tritons, including staff and parents, volunteered at the Los Angeles Regional Food Bank. 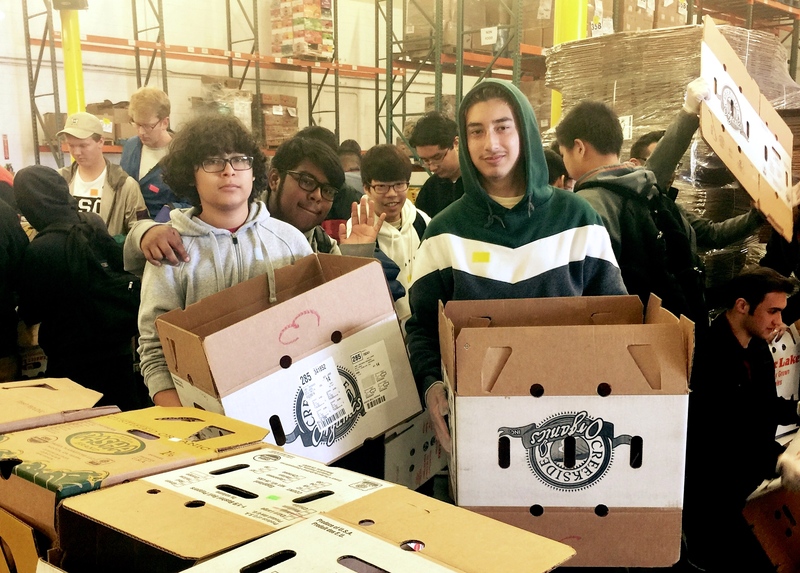 In just half a day, we made a tremendous impact by sorting through and packaging over one ton of food items for delivery to thousands of individuals and families in need. We are extremely proud of the positive work our Tritons have done so far. As Ye Ji points out, volunteering can be both a learning experience and a team-building activity. We hope many of our students will feel inspired to go above and beyond our school’s community service requirement to continue to positively transform their communities. Very impressive! Keep up the good work. Community service is an important life time commitment for all of us. Thank you for leading the way.